Plastic pollution is a global problem that many nations are grappling to address. Plastic waste is a major pollutant of our environment and poses a serious threat to the marine ecosystem as well as our very own well-being. This year’s World Environment Day (WED) theme “Beat Plastic Pollution”, with the rallying call: “If you can’t reuse it, refuse it”, sought to promote sustainable initiatives aimed at reducing plastic pollution. Nature Kenya joined the rest of the world in marking this day at various locales across the country. Kenya became a leader in this effort last year by banning the manufacture, sale and use of plastic bags. A few practical exceptions were made, such as labeled bags for waste disposal. There is still a lot of plastic used in packaging, however, requiring further action. In Dakatcha Woodland Important Bird Area at the Coast, the event was marked at the Bore Singwaya Primary School on June 9. Vivo Energy Kenya, for the fourth year running, sponsored the event which kicked off with a clean-up exercise at Marafa town. 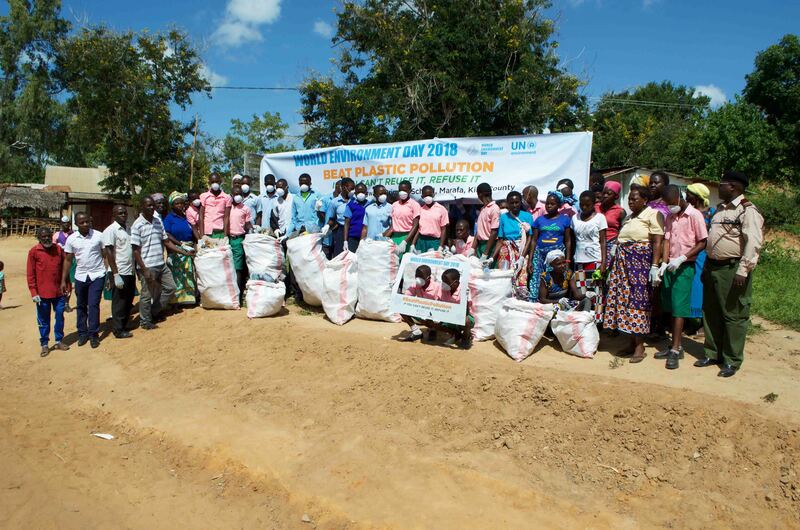 Students from Marafa Polytechnic and Marafa Primary School joined members of the Sauti ya Kina Mama community-based organization in collecting waste materials around the town. The exercise netted a substantial amount of plastic waste, which included discarded water bottles, containers and bags. After the clean-up, students from Bore Singwaya, Baraka, Kandunguni, and Kundeni primary schools joined in for the celebrations. Living up to the theme, students from Bore Singwaya Primary School demonstrated how discarded plastic bottles could be innovatively used to drip-irrigate tree seedlings planted to mark the event. The students also showcased other creative ways of reusing plastic bottles. The event was graced by the Kilifi Assistant County Commissioner Dominic Kinyanjui, who was the chief guest, Kilifi County Environment CEC Kiringi Mwachitu, Garashi Ward MCA Peter Ziro, representatives from the Kenya Forest Service, Bore Green Umbrella, Dakatcha Community Forest Association, Dakatcha Woodland Conservation Group and Action Aid, among others. Over 250 students and 150 community members participated in the event. The Jaramogi Oginga Odinga Park was the venue for the WED celebrations in Siaya, where over 300 people participated in the event. A clean-up exercise, tree planting session and a bird walk were among activities held to mark the day. Nature Kenya was actively involved the planning for the event. In the Taita Hills, the event was held at the Dawson Mwanyumba stadium, Wundanyi, on June 6, with Nature Kenya participating. This year’s national celebrations were held at the Kwale Baraza Park, Kwale County, and were presided over by the Deputy President William Ruto on June 6. Nature Kenya was among organizations involved in the planning of the national event.